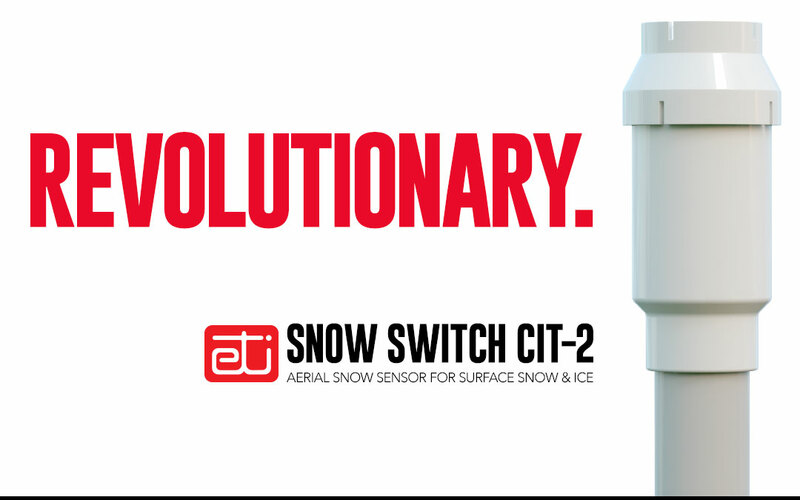 ETI proudly introduces the SNOW SWITCH® CIT-2 Aerial Snow Sensor for surface snow and ice management systems. The CIT-2 is designed to work with a controller or contactor, optimizing energy usage in heated snow/ice melting applications. The CIT-2 is also an excellent solution for building automation applications. During dry or warm weather, the system’s heaters are turned off to save energy costs. The heaters are turned on only when snow and/ or ice is present, and kept on only long enough to ensure complete melting and drying. Temperature and time parameters can be varied within the CIT-2, enhancing system performance in a given environment and application. Relay contacts: 2A max, 30V. is between min/max settings and precipitation is detected.